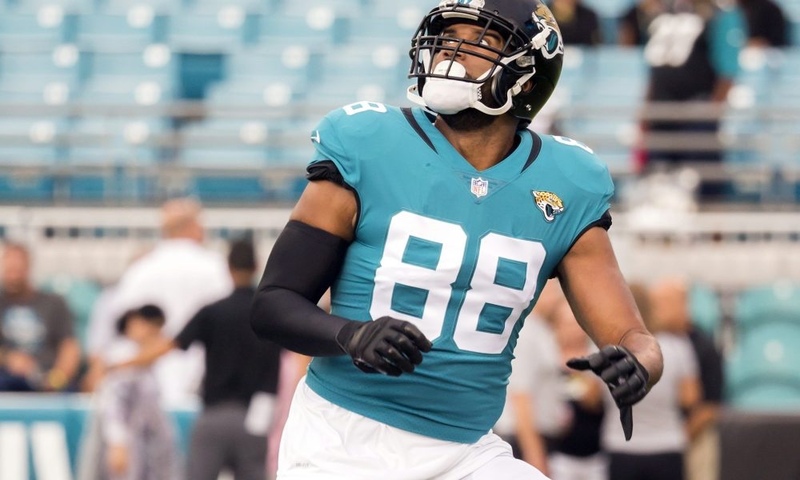 The Patriots signed veteran tight end Austin Sefarian Jenkins to a one year deal today. Jenkins spent last season with the Jacksonville Jaguars. Jenkins has also played for the Tampa Bay Buccaneers and New York Jets in his career. Jenkins has dealt with injury issues throughout his career. He only played in five game for the Jaguars last season catching 11 passes for 90 yards and a touchdown. When healthy, Jenkins has proven to be an effective producer. He caught 50 passes for 367 yards and three touchdowns for the Jets in 2017. At 6-6 260, Jenkins is a big target with a wide catch radius. He is athletic and has the speed to separate after the catch in the open field. Schematically, he should be a good fit in the Patriots offense. The Patriots lack experience in their tight end room so if nothing else, Jenkins should provide a veteran voice and leadership. The other tight ends on the Patriots roster currently are Matt LaCosse, Stephen Anderson, Ryan Izzo and Jacob Hollister. Even with the addition of Jenkins, the Patriots are expected to target (no pun intended) the tight end position in the up coming draft. The tight end class is one of the best we have seen at the position in recent years.